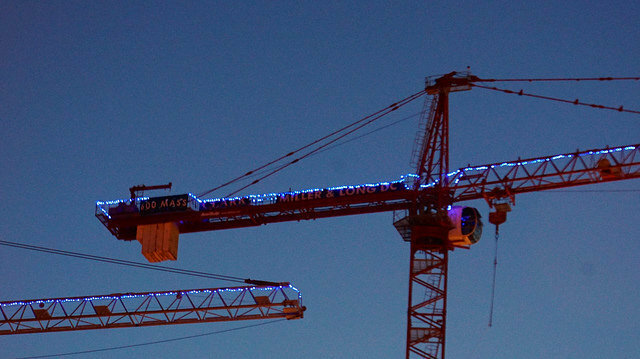 Where else would you see construction cranes become veritable ballet dancers? Anyone who has seen a construction site knows that heavy equipment doesn’t exactly have a reputation for elegance. But anyone who has operated or worked near it knows the precision and skill that go into every move. You could say that it’s a dance. On July 15, as dusk began to settle over Washington D.C., two construction cranes disproved every notion about the behemoths that stack high steel. Dance of the Cranes revealed just how delicate an operation it really is. The #danceofthecranes performance was presented by Capital Fringe, as part of the Capital Fringe Festival of 2015. Capital Fringe is community of artists in D.C. that encourages exploration and adventure. Its mission is to bring performing artists together with audiences and provide a means and an outlet for innovative performance art throughout the year. Choreographed by Brandon Vickerd, who also served as artistic director, the total performance lasted for the better part of an hour. It began as the sun started to settle, and continued through twilight and on into the dark. Special lighting enhanced the lines of each crane, creating both a light show and a dance in one. 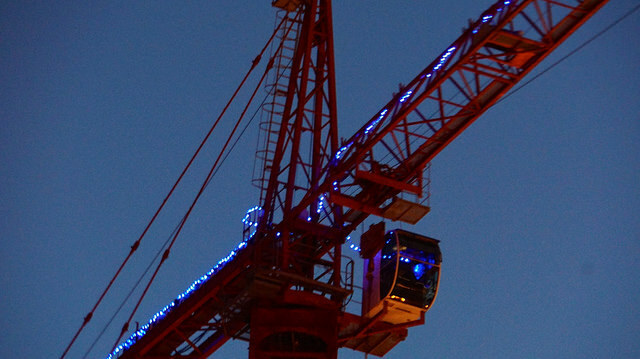 As festival goes settled down, the cranes began to come to life. Dance of the Cranes was an enormous undertaking that brought two high rise construction cranes into synchronized movement high over the Milian Park area. As the crowd watched and the sun went down, the cranes began to turn and sway together in perfect time, accompanied by ambient music that was heard throughout the park and surrounding area. This choreographed dance transformed enormous machines into a feature presentation of delicate, precise motion. The opposite of what the average onlooker might ever imagine. And sometimes that is exactly what art is all about – challenging ideas and promoting new ones. Encouraging people to think and examine the world in a new way. 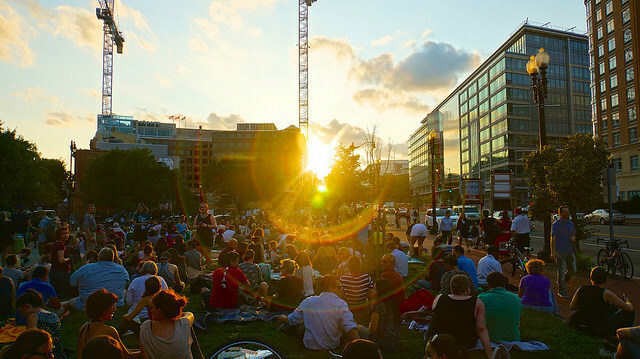 Washington D.C. has held the award-winning Capital Fringe Festival every summer since 2006. It sells tens of thousands of tickets annually, and keeps growing every year. This year’s festival schedule was initially slated to run from July 9 through the 26th. But as this is its 10th anniversary, an extra week has been tacked on. The festival should close August 2. Dance of the Cranes towered over Milian Park, but the festival spreads out around the city, according to DC Expert Rachel Cooper for about.com. Features and attractions found homes in Trinidad, Brookland, H Street NE, and several off-site locations. Art doesn’t need a strict definition; often it’s better when it doesn’t. There’s not always a rhyme or reason behind an artistic performance. Sometimes the purpose is only to encourage people to stop and think about something in a new way. Like walking through an art gallery, each person will carry out something a little different from the experience. With Dance of the Cranes, perhaps Capital Fringe and choreographer Brandon Vickerd wanted to bridge the gap that exists between the people who live in a city and the work that happens all around them. Choreographer Alison Orr did the same with her presentation, “Trash Dance.” Or perhaps the goal was to notice that cranes were there at all. When was the last time that you really looked at one? Construction makes the world go around. It creates, it secures, and it transforms raw materials into something whole and tangible. And it’s through continuing education courses that your skills stay as sharp as they need to be. Your work might not be as delicate as a synchronized #danceofthecranes , but it’s no less important. Start your course today. All images, by Ted Eaton, https://www.flickr.com/photos/taedc/ via Flickr Creative Commons license.